Artist Ronnie Olsthoorn was commissioned to create some dramatic artwork for the book. Ronnie already had an outstanding track record of producing superb digital aviation art and was a natural choice to put together something really special for the cover. As he works with complete 3D models it was not a big leap to re-use the model for some outstanding colour profiles too, and these are also to be found in the book. Ronnie's brief was to produce something as dramatic and iconic as the Shigeo Koike artwork used by Hasegawa for their original issue of their SEPECAT Jaguar 1/72 scale model kit - this depicted a Jaguar with a huge explosion behind it, and the concept evolved from those beginnings. 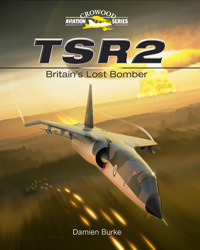 With an aircraft designed for tactical nuclear strike, it was clear from very early on than any large explosion in the background was going to have be a nuclear one, so the TSR2 would be depicted in its high speed escape from the target area. Ronnie put in 200 hours of work building an accurate 3D model of the TSR2 using original BAC and third party drawings plus a huge pile of photos - modelling even the tiniest of details, such as the wiring within the navigation beacons! The colour scheme for the jet was based on the BAC preliminary camouflage layout of late 1964/early 1965, though black was chosen for the nose radome and dielectric panels rather than the white BAC were hoping to use (a money saving effort as these panels were already being manufactured in a white finish). The serial chosen was XS666, no prizes for guessing why, given the name of the author! 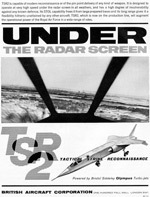 XS666 was a genuine TSR2 serial allocation, and this airframe would have been one of the pre-production batch of TSR2s. The background chosen for the artwork was based on an extremely appropriate photograph taken by Ronnie in the aftermath of Europe's largest peace time explosion - the Buncefield oil storage depot disaster of December 2005. The smoke plume was visible across much of south-east England, and the apocalyptic atmosphere of Ronnie's photo was perfectly suited to the scene. Adding a nuclear detonation to the background was the next step, and it was at this point that we realised that the resulting scene was beginning to show some distinct similarities to one of BAC's advertisements of 1965 that showed the pilot's eye view of a low level attack run. As a result, part of the skyline of the target area shown in the advertisement was incorporated within the cover art - it's there if you look closely! Finishing off the artwork was the addition of some tracer fire rising up from an anti-aircraft vehicle that the aircraft has just overflown. The vehicle in question is a ZSU-23-4 'Shilka' - which, coincidentally, began development in 1957 just when the requirement that led to the TSR2 was being drafted, and entered service in 1965, the same year that the TSR2 project was cancelled. East German forces operated the Shilka from 1968 onwards, the same year that the TSR2 was due to enter service. Our cover crew have planned their mission to avoid known anti-aircraft batteries, but have been unlucky enough to fly too close to an East German regiment equipped with the Shilka - and their underwing counter-measures pods have been emptied on the way in to their target and thus have not responded to the Shilka's radar. At any rate, this crew are getting out of Dodge as fast as they can - the final artwork is entitled "Hell for Leather". If you'd like to buy a copy of the cover art, Ronnie is selling t-shirts, posters and canvas prints via his website.